Maria G. Pisano, “Viva Voce,” 2011. 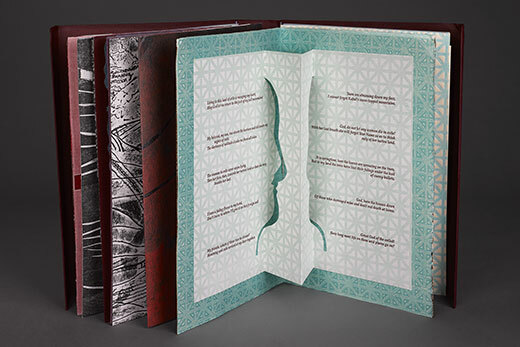 This artist’s book will be out from under the display glass for the Bound with History event. Photo by Paige Knight, Emory Libraries. Guests can examine artists’ books up close and find the “common thread” in a new exhibit and related event on Thursday, Oct. 11, in Emory’s Stuart A. Rose Manuscript, Archives and Rare Book Library. “Bound with History: Encounters with the Rose Library’s Rare Book Collections” will take place from 4:30-6 p.m. in the Rose Library. The event is open to the public at no charge, but guests must register at emorylib.info/bound. Two book artists, Ellen Knudson of Crooked Letter Press in Gainesville, Florida, and Andrew Huot of Big River Bindery in Norcross, Georgia, will talk about their training, inspiration and process, from 4:30-5:15 p.m. Guests will be able to touch and turn the pages of selected artists’ books, which will be out from under the display glass, prior to the program at 4:15 p.m. and after the conclusion at 5:15 p.m. A reception will follow at 5:30 p.m.
“We will display artists’ books that participants can examine up close, including works by the speakers, Knudson and Huot, as well as those by book artists and binders such as Julie Chen and Walter Hamady, whose work inspired our speakers in their own creative process,” says Beth Shoemaker, Rose Library’s rare book cataloger. “Common Thread: Women’s Experience through Artists’ Books,” an exhibit of artists’ books by women, will open on Oct. 8 in the Rose Library. Visit the exhibitions page for hours and more information. The Rose Library is located on Level 10 of the Woodruff Library at Emory University, 540 Asbury Circle in Atlanta, 30322. Parking is available in the Fishburne deck. For disability-related accommodations, please contact Emory Libraries events manager Maya Cody in advance at 404-727-7620 or maya.cody@emory.edu.